In 1861 Rudolf Leonhart accepted a teaching position in the German-American community of New Ulm, Minnesota. Unknowingly, it placed him in the midst of one of the most significant events in American history—the U.S.–Dakota Conflict of 1862. Leonhart wrote his reminiscences, Erinnerungen an New-Ulm, in 1880. Filled with humor and keen observations, Memories of New Ulm stands as one of the few lengthy descriptions of these events. 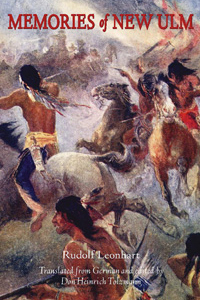 It gives us an eyewitness account into life on the frontier, the two battles of New Ulm, and the retreat to Mankato. This is its first publication in English. Leonhart returned to Pennsylvania with his family, where he became a prolific author of novels, writing in English and German, dealing with German-American life. His New Ulm book is the only historical work. Don Heinrich Tolzmann, one of the nation’s leading scholars in German-American history, provides an insightful introduction to his translation of Leonhart’s text.